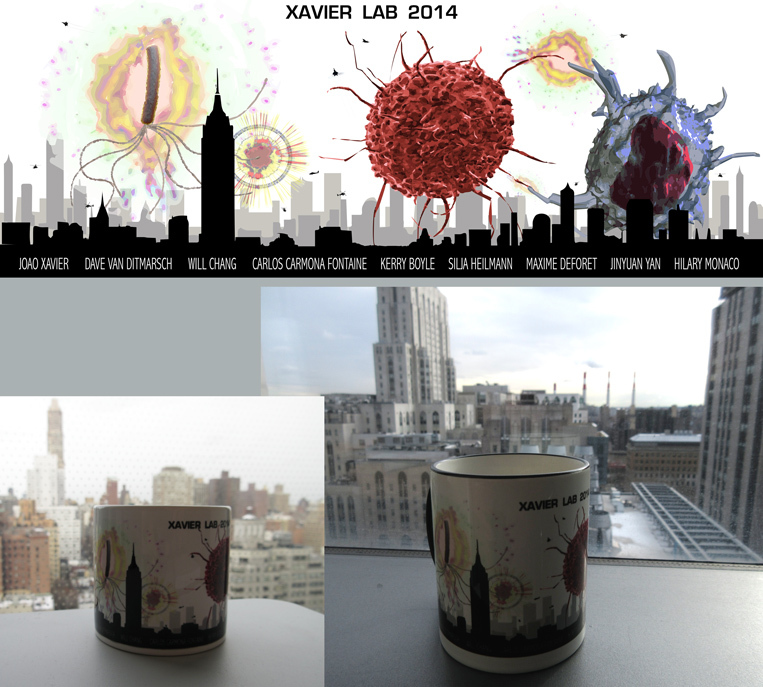 The beautiful Xavier Lab Mug, 2017 edition is the best way to drink coffee, tea or hot chocolate; it’s guaranteed to work throughout 2018 and beyond. And here it is, stilling the stage from the Trump Palace, its less glorious Upper East Side neighbor. Design by Carlos Carmona Fontaine. This mug was created by Carlos back in 2013. Carlos used the jet colormap of Matlab at the time but since Matlab adopted the parula as the new default colormap so did Carlos. This year we celebrate Will’s graduation (Jan 27) and our new assistant, Amy Webber, who joined the team last year. Scandinavian design by Silja Heilmann (2014/2015). In 2014 we opted for the action movie theme. 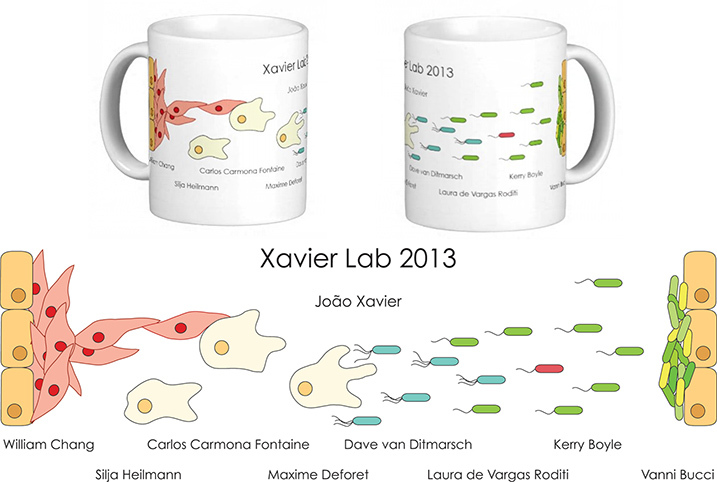 The 2014 official X-Lab mug (sold out) comes in two sizes: Expressino (left) and Instant (right). The design features a giant-sized hyperswarmer fighting it out with a macrophage-assisted and equally gigantic cancer cell over New York City. Confused Apache helicopters and fighter planes circle the sky, powerless to stop the mayhem. Enjoy the coffee. If you can get your hands around one of these beauties. “Drop the pipette. We’re taking over.” X-Lab monsters mean business. Unique edition collectible figurines. Make great farewell gifts for an admin who has been in the lab for, say, four years and has just been promoted. Designed by Kerry Boyle (2013).